This is Victoria, happy today to invite you to join me in thinking outside of the box, but even more—let’s jump outside the box. Today, I’d like to explore the Dadaist movement—a movement that, perhaps, is most associated with visual or performance art, but that also had a profound impact on poetry. 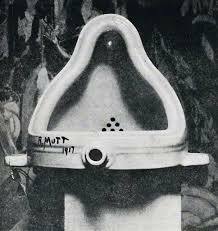 When I think of Dadaism, my mind conjures up images of urinals, irony, anti-art, found objects, collage, word play, collaborative art and just about anything that doesn’t seem to fit into our preconceived idea of what should be. Dadaism was born of the horrors and brutality of World War I. Disillusioned artists of all disciplines, affected by the degradation of social structures, repressive cultural values and unquestioning acceptance of a War that led to so much loss of human life, rebelled against the status quo. A loosely affiliated network of artists and poets, originally clustered around Zurich, adopted a subversive and revolutionary approach to visual art, performance art and poetry. These artists did not so much adapt a common style or practice, but rather sought “to destroy the hoaxes of reason and to discover an unreasoned order.” Jean Hans Arp. The focus of their work was not so much on beauty or appearance as on the ideas the work conveyed. The Dadaist movement laid the groundwork for abstract art and sound poetry. When I studied Dadaism in the course of my docent training, I recall having to read aloud (as a group) a poem that consisted only of nonsensical sounds. The exercise aimed to lead us as readers/listeners/speakers to an understanding of the value of sound itself. In a subtle way, it seemed to challenge the words we utter as the expression of babbling idiots, making about as much sense as those who silently acquiesce to the supposed logic of war. I confess, though not a huge fan of Dadaism in art, and though I am probably as close to conservative as a poet can be, there is something freeing and tantalizing about the thought of abandoning long-held rules and expectations and taking the opportunity to play with words in a way that is countercultural. Should you wish to research Dadaism a bit more, here are some names associated with Dadaist art or poetry: Jack Spicer, Ezra Pound, Marcel DuChamp, T. S. Eliot and Man Ray. Spread the word using your social medial contacts. We are always happy to welcome new poets to the pub. Welcome, poets. Here’s a chance to get as wild as you want. To be honest, DaDa definitely takes me out of my comfort zone–hope you will dare to come along. congrats on the win claudia…i did not get the chance to holler for you ….smiles. Can’t wait. 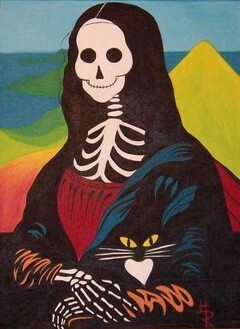 This is just my kind of thing. Hi Victoria, this was an interesting prompt. It is outside of my comfort zone too. I have a hard time with things that aren’t ordered in some way or things that don’t make sense. So I did one….but it makes some sense. LOL. (As does yours!) ButI took a look at a lot of Dadaist paintings, thinking I might take the approach of writing to a painting, and the paintings were nothing I would want hung in my house. So I forgot that. I’m glad you jumped outside the box. We are alike in many ways, heh? Loved your sound poem, Bjorn–poets, be sure to LISTEN to it. I had.. to just write sound was more fun that I thought.. and it was actually easier to read loud than a poem with content. nice.. have fun at the dinner! I tried this but couldn’t figure out how to do it…I guess I expected it to do it for me. It worked my second try but was too crazy. Thanks, Grace. May try again if I have time. I agree. I thought mine was totally disjointed since I just took tidbits from a newletter, from different articles. But as I searched for a title, there was a theme? Fabulous prompt, Victoria! I loved learning about Dada as part of my wider reading around my history studies at school, so thank you for the time-travel today. Thank you for hosting tonight as well – it won’t be your ordinary bar tonight! I don’t know what I was thinking when I tossed out dada…I’m so literal. Hope I can do justice to my comments! I did this against my better judgment–I mean if you don’t like reading DaDa poems, why write one? But I like that DaDa shows/is the lack of meaning everywhere in the face of the enormity of death; I like that it even rejects the sense of “OK it’s our turn” now of expressionism. To me it is horror, no ground to stand on. I hate horror and don’t hate much else. Needless to say, you need not visit this poem. FYI: This is a rather DaDa-ist comment, or intends to be. It is not a rejection of the prompt. I love the prompt. Ha! Your comment is longer than your poem! Have fun with the in-laws, Brian. ha. maybe we will see each other next round…smiles. I’ll be over to read in a minute–and I can’t imagine anything that doesn’t fit dada. Agree we do have some dadaist hidden in there. If I remember correctly we were standing on chairs around the classroom reading different lines from a poem we had written ourselves.. and the climax of the performance was that we let a discarded washbasin being levitated on ropes across the classroom.. so I have some early connections to dada. DaDa performance is the truest DaDa. Dang, I wish we did things like that in school. What a fun topic Victoria! I am enjoying the writes of my fellow poets. So many different approaches. Thank you!! You left a poem for me, Gay. Thank you! Glad you’re having fun with it, Gay. Gay–you need to go back to everyone you visit, copy and paste your comments into one piece, then add another link. They are great works of dada. I started late…but when more post, I will. I thought it was a cool idea. Thanks! Hope you post it sometime. I am a Dadaist Scientist when it comes to writing and experimenting stuff like this. I will be posting a weird Dadaist poem. I’m fastening my seat belt and off to read, Charlie. ha. i am looking forward to it charlie…i am having a withdrawl from your poetry…. Sounds like my kind of poetry! alright, be back in a bit….going on a little adventure before i lose the sun.. I know I’m being quirky today, but many of your poems made me want to play with your words in response. I think all of them are brilliant and I definitely am not trying to “one-up” anyone. I am perfectly happy with the one I posted. Please forgive me if I have in any way offended you or stepped on your toes. You know, I’m starting to enjoy this too–and I don’t think anyone would be offended. 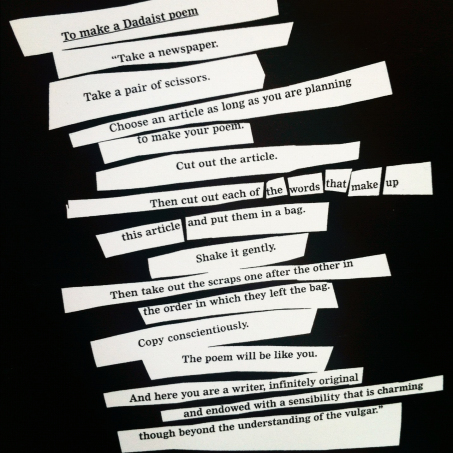 The Dadaists were big into collaborative poetry–playing off of each other’s work. You are, perhaps, a Dadaist unaware. i have gone back and read most of your responses now…and have a very wide smile. Thanks Brian…it’s giving me a giggle too! War is a great dislocation…. of people and culture… everything is broken – perhaps that art mirrors the schism of the times. There must have been a lot of conflicted emotions as there always are in association with war. The movement began in Stuttgart and spread into France–two countries so affected by WW! It really shows – but beauty hasn’t really deviated much over the ages, always tending to the symmetrical – and this work seems so asymmetric. It’s energetic – irreverent – and a bit desperate. Fabulous prompt – Tristan Tzara was of Romanian origin, like me, so there must be something slightly off-kilter or revolutionary about us. I don’t enjoy all Dada art or literature, but I certainly appreciate their quest for freedom, their recognition that not everything makes sense – or has to. Welcome, Marina. Maybe you have some of his DNA floating around in you! Second link is correct one – I changed the title and layout! i will clean it up viv…. Fun prompt which made me think out of the box or words? Enjoyed it a lot ..trying to read every ones..i will do my best..smiles..
hey i like fresh words…smiles…. It’s fun reading them, arathi. I’m not sure the Dadaists had the hang of it–no rules! That would be fun, Bjorn. In Reno, we have an art show, that I participate in called NADAdada. and I’ve done dada for a long time…a very cool technique. Tzara was brilliant and so were the guys who borrowed it from him: William Burroughs and Brion Gysin. My poem about dada will be up soon! Ha. Made it! A bit silly–my poem. k.
I’ve done this type of art and didn’t even know it had a name.